This is a magnificent shot of my thumb, don’t you think? You may or may not have heard on the American news that we had 2 – 2 1/2 inches of snow here this week, resulting in ice, resulting in 4 million folks all heading home in the middle of a minor snow storm, compacting more ice and ending in a massive traffic gridlock…and stranded motorists. This event is now not-so-affectionately known as “Snowpocalypse 2014.” I still feel so badly for anyone who went through the stress and frightening strain of being stuck in traffic or stranded for hours—and in some cases days—on our roads and interstates here in Atlanta as well as in Birmingham, Alabama. Hopefully everyone is home, safe and sound by now. 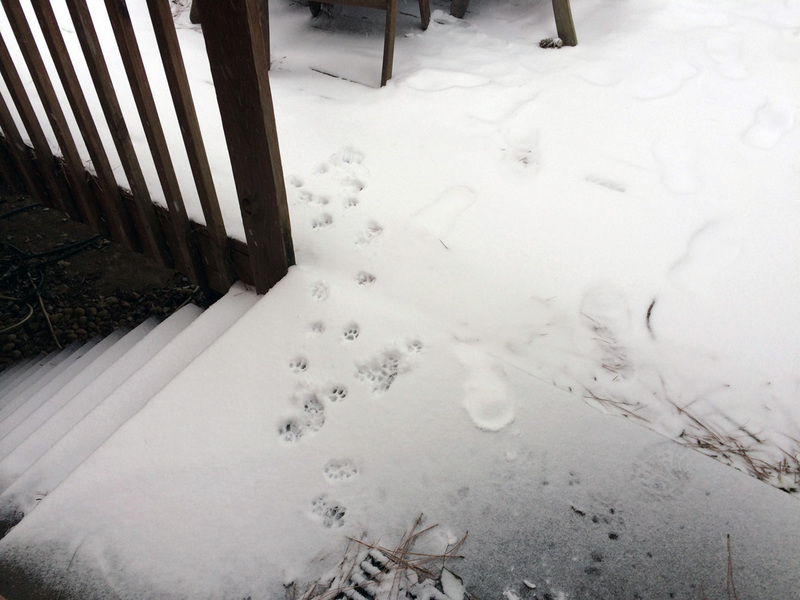 This is what our Southern felines thought of the snow. In addition to a stiff single-malt scotch, there’s nothing that can take away the sting of enduring such an event quite so well as these easy, chewy and toffee-covered Heath Bar Blondies. And hey, they’d be a good choice for the Superbowl festivities, too. Not a fan of toffee? Use the same amount of mini semi-sweet chocolate chips instead, and lightly press them into the top of the batter before baking. Stop me before I eat the whole pan! Makes 3 dozen rich bars, plenty to soothe your raw nerves and some to share, too! Grease an 8 x 8 inch square baking pan with butter and set aside. Preheat the oven to 350 degrees F. Combine the sugar, butter, egg and vanilla in a medium-sized bowl with a whisk. In a small bowl, mix together the flour, baking powder and salt, then pour it into the butter mixture. Stir with a spoon to combine, until the mixture is moist and just blended. Spread the batter into the prepared pan, smoothing evenly. Scatter the toffee bits or the chips evenly over the top of the batter and press lightly to adhere. Bake at 350 degrees for 20-22 minutes, until the blondies start to pull away from the sides of the pan, and a toothpick inserted into the middle comes out mostly clean. Remove from the oven and cool completely in the pan on a wire rack. Cut into 36 small squares. Relax. Hard to believe such a beautiful little snow could wreak so much havoc. This entry was posted in Cookies, Desserts, Food and tagged Blondies, Chocolate Chip Blondies, Heath Bar Blondies, Heath Bars, Snow Days, Superbowl, Toffee bars by bitsandbreadcrumbs. Bookmark the permalink. We’ve been watching the news, and people here just cannot believe how a couple of inches of snow could paralyze a city like that (I’m from the Buffalo/Niagara Falls area…we’re used to BIG snow!! 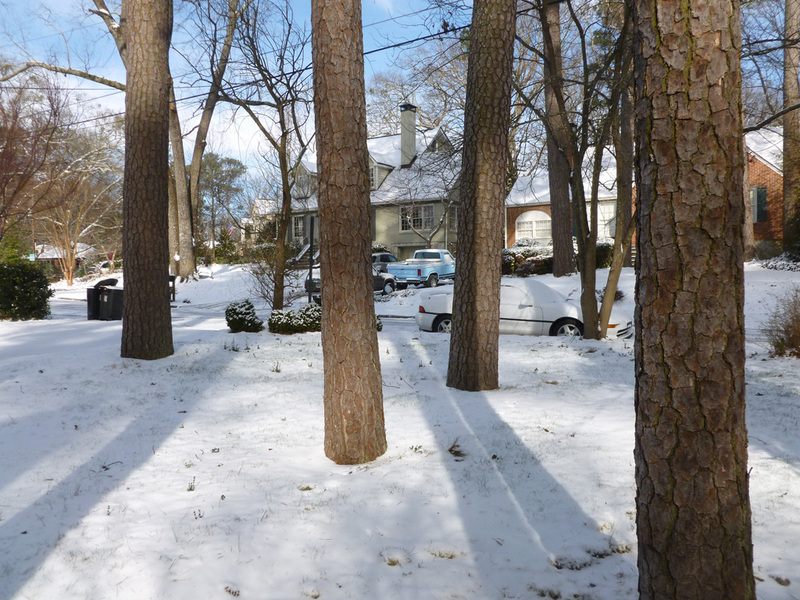 )… but then I argued with everyone that it wasn’t really the snow so much, as it was the ice. I couldn’t believe how thick that ice was. I don’t care how much experience you have in the snow… when a car decides it wants to slide on the ice, not even the most experienced driver could stop it from going where it wants to go. I feel for you, and hope that you’re all back to normal now..
We’re finally having a heat wave here! I think the temp is finally up to 31 today!! We’re supposed to get yet another snow storm, but with the temps so high, it’s not going to be all that bad..
Oh Betsy, I just watch with amazement!! I cannot believe the snow and how difficult this has been for all of you! I keep thinking that I could still be up there!!! What’s funny was that I had refused to buy a winter coat when I was there, but I think a winter coat and BOOTS would have been needed for sure had I stayed! Now I’m originally from Ohio, so I do know about snow, I just don’t want to deal with it any more! I will admit though, the pics I’ve seen are so beautiful of the trees and landscapes covered in white! I’d be snuggled in baking too, the perfect thing to do on a snowed in day and these are worth the splurge!! You left at a good time, Linda. The northern perimeter of the city was probably impacted the most. We’re lucky in that we both work from home, so didn’t have to stress too much about it. But we had friends caught up in the whole mess. Crazy! Hey! I got kicked off of your blog�but now they let me back on. Was it something I said? Hey Kath, no I don’t think it was anything you said or did. Sometimes weird things happen like that with WordPress. It’s happened to me before with folks I subscribe to and I had to resubscribe. I think it may happen when they are updating the software and templated features. Glad you persisted and welcome back! Happy Friday! I’ve been keeping tract Betsy, it did indeed look awful, I too feel bad that so many were stranded. These bars would sure reduce that white knuckle stress driving on Ivey roads would bring. They are quite lovely too and cutting them into smallish squares would allow an additional indulgence. I didn’t think I could like another treat more than those you baked for your helpful firemen, but these…dangerous would be an understatement—you know how I feel about chocolate and caramel! Yes, we are in Atlanta, though fortunately both my husband and I work from home, so no commuting. We had friends and neighbors who got stuck for varying amounts of time. Folks who worked downtown, which is a straight 15 minute drive from here, spent 8 hours trying to get back home to our neighborhood. Just unbelievable. And now that the ice has melted and the snow is almost gone, and it’s 50 degrees, the schools are out today. Underreaction and overreaction. Maybe next time the city will be ready…I hope so! Sounds divine. It was great to see you this week. Looks like a sweet treat! It has been a freaky weather year here, and this winter, especially. I’m so glad your friends were able to get home without getting stuck all night! We know of folks who spent 8 hours trying to travel 5 miles. Incredible. I have a sweet tooth, too, Betsy, although I don’t have any snow. We finally got some rain this week. I have been working very hard physically, pickaxing the yard and carrying my thirty-five pound guitar case — if I could eat off the screen I would! Thanks for the virtual toffee blondies. Can you imagine the havoc if snow ever fell in Hong Kong? Need I say more when people are not used to the white stuff it wreaks havoc. 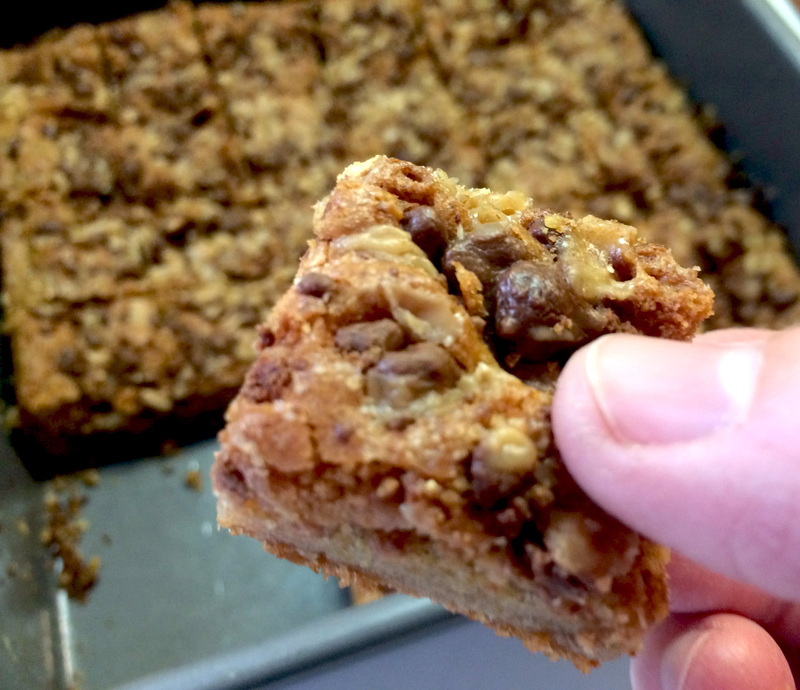 These Blondies are a great way to celebrate half time! Actually after last week here, I think I can imagine the havoc wreaked by snow falling on Hong Kong, LOL! Hope you are well, BAM and glad you like these Blondies! Yes, sadly we made the world news in a not good way. I don’t think our governor will be re-elected, that’s all I can say. 😉 Thanks, Claire! We get a bad, and sometime justified, rap here about snow and ice from our northern countrymen. Maybe it’s because we’re all in one country and everyone makes fun of different regions for one reason or another. But when you aren’t accustomed to ice and snow and don’t have snow tires, it gets crazy for sure! I didn’t realize Atlanta ALSO had a big mess/disaster. So sorry to hear that. But – your followers reaped the benefits in these delicious recipe. Too funny – recently I, too, thought of posting a recipe for Blond Brownies & I like your recipe better !! Very soon I want to do my 2nd post featuring some of my favorite blog’s recipes – where I include the photo & the link. I’m gonna start a list right now AND this recipe’s going on the top of the list! Cecile, you are too kind. Thank you for your lovely comment and I’m so glad you like these Blondies. We ate too many of them! 😉 Yes, we had a real mess here earlier in the week. We’re not used to much snow and ice this far south, and usually what we get is ice which is terrible when your roads haven’t been treated. I am sorry to you had to go through so much frustration, I didn’t realise winter was being so severe! Stay warm, and enjoy these delicious bars, relaxing indoors! Hi CCU. This is the first real winter weather we’ve had in terms of snow/ice. We usually don’t get much and are always pretty unprepared. Winter’s been weird so far. Really warm temps with tornado warnings (usually June for that) and then 5 degrees with everything freezing and now this. Global whatever! Thank you Bec, we will try and stay warm, safe and dry. Same to you! Rainy days and snow days always make me want to bake! 🙂 Stay dry, Dede. Heard about the conditions from my friends in Atlanta. Glad you are back to normal. Hope you will not be affected by any more storms. It has been snowing where I am since this morning prediction is 1-3 inches but I think we are in for a whole lot more, will find out when it stops. I do love snow, but not ice. Sounds like you have a nice snow event happening. We’ve heard a rumor here that it may snow again next weekend. If that’s the case, I sure hope the city will be better prepared! Your heath bar blondes would definitely sooth frazzled nerves. Looks amazing and easy! How perfect! © 2011-2018 Betsy Burts, Bits and Breadcrumbs. All rights reserved.